Keep up with local news. Once you subscribe, keep an eye out for the updates in your inbox! We close out each year by joining people across the country in honoring those whose lives have been stolen by the systematic problem of homelessness. We don’t simply gather to honor people in word, we gather to further commit ourselves and our organizations to honor those we have lost by continuing to act, by honing our strategy, by bolstering our resolve and growing the strength of our persons, organizations and coalition. Please email Josh Spring (joshspring@cincihomeless.org) to let us know about anyone who died in 2018 while experiencing homelessness or as a result of homelessness after reaching housing so that we may include them in our memorial gathering. If you are unable to share a person’s full name, that is okay. If you are able to include a person’s date of birth or age, please do. We ask that you send the names of those who have died so that we may specifically declare their immeasurable value. Friday, December 21st will mark the longest night of the year. On this day at 5:30pm we will gather in Washington Park across from music hall, under the tree where Joann Burton was run over. From Renter’s Rights to the Homeless Bill of Rights, many of us are in the dark about the legal processes, procedures, and regulations that affect our daily lives. Deadbeat landlords pose a health and safety issue to our neighbors, but what can you do about it? 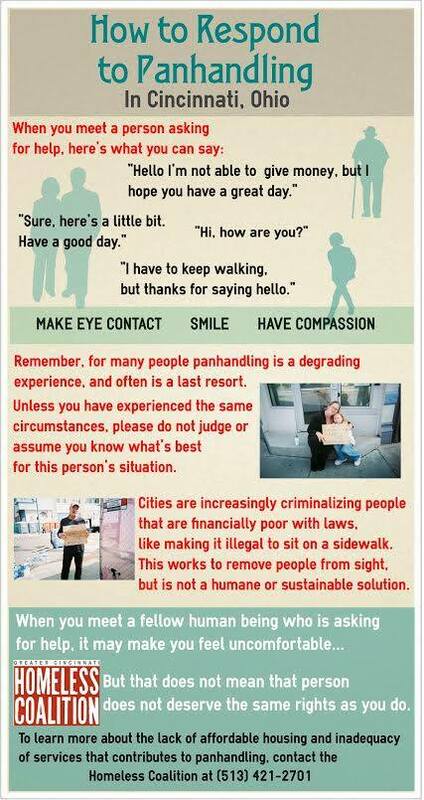 The City and County have teamed up to criminalize homelessness, but what does it really mean? Who stands to benefit? We hope to make this informative and interactive, with materials from our member organizations including HOME and Legal Aid, as well as personal account from individuals who have been through the struggle, including evictions and housing discrimination. We’ll have materials to take home for you to review and share. Bring a friend and arrive early – you don’t want to miss this!